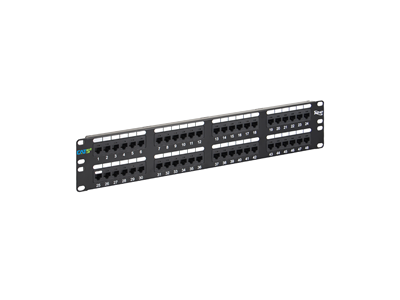 Rack mounted CAT 5E component rated patch panel provides excellent performance for data networks requiring maximum speed and bandwidth. Enchanced crosstalk cancellation reduces return loss and improves performance by rejecting noise and unwated signals. Exceeds ANSI/TIA/EIA-568-B.2 Category 5e connecting hardware requirements. Engineering to provide 110 IDC termination reducing installation time. Includes both TIA-568A and TIA-568B color wiring diagrams. Backwards compatible to all lower rated category components. Designed to fit all standard 19 inch racks and cabinets. 2 rack mount space (RMS).